First, the title of the press release: “Gov. Malloy Announces State’s Use of Lean Tools Makes Government More Responsive and Efficient.” Lean is not a bunch of tools for improving responsiveness and efficiency. In my teaching of Lean at a Connecticut university, I define Lean as: “A non-zero-sum principle-based management system focused on creating value for end-use customers and eliminating waste, unevenness, and unreasonableness using the scientific method.” State leaders and employees must shift from understanding Lean as tools to a new system of management for all state government agencies, and, eventually, all of state government. 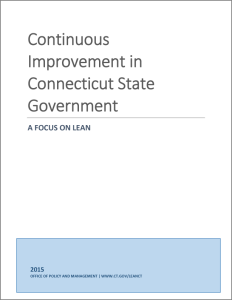 Second, the word choice in describing Lean: “Governor Dannel P. Malloy today announced that over forty state agencies have become more cost-effective and efficient in the past year thanks to a program he initiated in 2013.” Lean management is widely misunderstood as a “program,” which implies it will end on some future date. Lean management is a replacement for conventional management, rooted in batch-and-queue processing (hence, the long delays in rendering government services) with flow. Because flow is challenging to achieve, and because circumstances are changing every day, there is no end to improvement. Word choice matters when it comes to Lean, and the word “program” misleads people (as does “tools” and Lean “event”). Third, the implied relationship between Lean and job loss: “State government is about 1,000 positions smaller than when we took office. As that’s happening, our workforce is becoming more efficient with important management techniques.” The association of Lean with job losses in the press release is likely inadvertent, as I am reasonably certain that no state employee has lost their job due to Lean. Lean management has been frequently used by industry leaders as means to cut costs by laying off employees, earning it derogatory labels such as “Layoff Every Associate Now.” The intent of Lean management is not layoffs. It is to grow (e.g. offer new services) and improve, reduce process costs, and utilize employees in new capacities within the organization if their job is no longer necessary as a result of process improvement. If leaders wants the full participation of employees to access the innovative and creative ideas necessary to achieve flow, then employees must be completely free of the threat of job loss due to continuous improvement. The two principles of Lean management, “Continuous Improvement” and “Respect for People” are inseparable. One cannot achieve continuous improvement if employees or other stakeholder is harmed (disrespected). If harm is done to people, then the best than can be achieved is one or two or three cycles of improvement. The desired condition is never-ending cycles of improvement. The LeanCT “efficiency program” is managed by of the Office of Policy and Management (OPM). This is one of 68-plus state agencies. A major component of Lean management is the engagement of employees in process improvement and the development of human resources. Thus, people are central to Lean management and its success. While one of the many favorable results of Lean (done right) is cost reduction (as well as lead-time reduction and quality improvement), placing responsibility for the LeanCT “program” in OPM, the state’s budget and policy organization, is an error. It should reside with the most senior person responsible for the value creating activities of the organization that provides government services – the Governor or Lieutenant Governor. If not them, then it should be the heads of operations or human resources, not the head of the budget agency. A long-standing concern of mine, and for which I have written some 16 books and more than 30 research papers, is to correct the numerous misunderstandings that people have about Lean management and Lean leadership, dating from its inception to present-day, which leads to many errors and poor outcomes. There are specific methodological errors that are commonly made in the adoption of Lean management by state governments, which you can view here. The State of Connecticut has made some of these errors, which in turn points the way towards improvement. Process – The persistent representation of improvement activities as “projects.” Along with that view naturally comes a project management approach to improvement, which greatly slows down and bureaucratizes continuous improvement activities. The result, as you can see from the report, is an average of four projects per reporting agency in a 12 month period. Continuous improvement is a daily activity, not a once-a-quarter (on overage) “Lean event.” Improvement would proceed faster by replacing the project management approach with kaizen to achieve flow. The measurement units (page 4) is good. Results – In Lean, the amount of improvement is typically expressed as a percent of a non-financial metric. The percent improvement is typically large, 100 to 1000 percent, when one goes from batch-and-queue processing to flow. However, the report shows improvement is generally in the range of 10 to 90 percent. This indicates that the process used to make improvement can be significantly improved. It also illustrates the limitations of a Lean tools-based approach to improvement. Targets – The “target value” for improvement can be more far aggressive (and should be established by team members). For example, if a process formerly took 90 days and was improved to 29 days, the next goal should be 3 days. But why stop there? The future targets should be 2 days, then 1 day, then 4 hours. If a process formerly took 1218 labor hours and was improved to 354 hours, the next target should be 35 hours. But why stop there? The future target should be 3.5 hours. These more challenging targets inspire human creativity and innovation, and lead people to ask questions and think about processes in ways that they have not done before. Notably absent is engagement in Lean by the state’s institutions of higher education (i.e. Board of Regents and the University of Connecticut). These are large-scale enterprises comprising tens of thousands of stakeholders and have thousands of administrative and academic processes long in need of significant improvement. But beware, higher education institutions also suffer from similar methodological errors in their practice of Lean. In the Yale Daily News, I was quoted as saying: “…the results the 40 state agencies have experienced are in line with what would be expected from such an approach.” The state could obtain much better results, and employees have a lot more fun, if state leader’s understanding and practice of both Lean management Lean leadership were improved. A key to that is kaizen. It is how you learn what Lean management is and how one obtains spectacular results that benefit all stakeholders. An emphasis on cost cutting or job loss won’t engage people in improving how government works. It won’t engage people in providing better service or value to the citizens and taxpayers of Connecticut. I can only hope that a program of tools and projects can evolve into a culture, philosophy, and management system – Lean thinking… better thinking, better results, eh? That evolution is what we are striving for. We are starting where we can and intend to continue to improve! Bob – Thanks for the analysis. Your perspective is much appreciated and will be incorporated into our future planning. Moving a ship as large and complex as ours is no easy task, but thankfully, the “people” you reference are committed and mission-driven. Public servants are, by virtue of our industry, incredibly dedicated and humble. I am so honored to be part of this shift. I hope you will join us as we move forward! A tools only approach is a fools only approach. You presented a very fair and clear analysis of your perspective of the current lean approach in state government.